"After this Magisterium, after this long journey, we can affirm with certainty and with Magisterial authority that the Liturgical Reform is irreversible". This sort of thing has the capacity to upset people; even to make them panic. And, true, there is a dash of "I'm the Big Magisterial Boy in the Playground and I can make facts happen just with one little word" in the way this rather unappealing man expresses himself. But I think panic is quite unnecessary, and is even an unfair overreaction to what he has actually said. "Irreversible". Pope Pius XII rightly condemned 'liturgical archaeologism'. Of course you cannot reverse liturgical development. Nobody has ever done that, in the course of these two millennia. But the liturgical texts and practices established after the Council are themselves not immutable. If a papal instruction, such as that of S Pius V in Quo primum, was in itself subject to change ... and Bergoglio seems to assume that it was changeable ... then clearly what Blessed Paul VI did, and what the current occupant of the Roman See now says ... are themselves changeable; they cannot be set in stone for ever. Pope Francis has exactly as much papal authority as S Pius V. He does not have a milligram less. And he does not have a milligram more. ... then it acceptable now for us to explain, at any length we like, what (in our view) is wrong with the Liturgy as it is done now in so many places. Pope Bergoglio is absolutely right. Liturgy is not reversible. Nobody can magic the Catholic Church back to how it was in 1962. Or in 1939. Or any other time. Liturgy will go on. Two of the ways in which it seems to be going on are the continuing reappropriation of the Extraordinary Form of the Roman Rite. And an increasing tendency to do the Ordinary Form with more reverence for Tradition. All over the world, cathedral and church sanctuaries are being freed from the worst of the mistakes of the 1970s. And Pope Francis, in his latest address, includes a fine section explaining the importance of this instinctive respect for the Altar. (Might it perhaps have been written for him by Cardinal Sarah?) And, while I am on this subject, I will remind you of the Holy Father's Address at the general audience of August 2, when he spoke about the liturgical significance of facing East. He lamented that "in modern times, the fascination of this rite [facing East in Baptism] has been partially lost: we have lost sensitivity to the language of the cosmos". (Might he perhaps have listened to Cardinal Sarah?) Traddies should not always too readily assume that everything Jorge says is the blackest villainy. And the Extraordinary Form is in cultural (rather than rubrical) ways rather different now from how it was before the Council (in the 1950s, I was in my teens). It is no longer performed in a hurried, perfunctory, slipshod way. The congregation no longer packs the back of the church because it is in such a hurry to escape at the very earliest possible moment. Among both celebrants and congregations, at the Extraordinary Form there is a wonderful sense of freshness and of wonder, which is certainly lacking in many of the 'mainstream' churches, with their sluggish and infantilised congregations, their frightful music, their unworthy homilies. Are the 1962 liturgical books immutable? They are certainly not so regarded by many who most enthusiastically attend them. Over the last couple of decades, increasing numbers of groups have restored the pre-Pius XII Holy Week ceremonies. Just as the Novus Ordo recovered euchological texts drawn from early sacramentaries and brought them back into use, so the Vetus Ordo will naturally do something similar. It will not, because it cannot, remain static. There is, indeed, nothing sacrosanct about '1962'; Benedict XVI appears to have selected that particular edition and recension of the Roman Rite mainly because it was what Archbishop Lefebvre had done earlier. I would like to see, not a wholesale and block and doctrinaire restoration of the texts or practices of any particular year in the past, but the further sensitive and unhurried and judicious evolution of the Old Rite. I have already mentioned Holy Week. I will add: the restoration of more vigils and octaves; and (at least for doubles of the Second Class) the restoration of First Vespers. I also think we should follow the SSPX French Ordo in providing for the use of the so-called 'Gallican' Prefaces. And we could borrow from the Novus Ordo the permission, on lots of ordinary weekdays, either to commemorate a Saint or to observe the Feria. If I am making a general point, it is this: rather than digging our heels in and nervously crying "Not an inch", we should let the classical Roman Rite shine ever more gloriously, attracting yet more people (not least, the young) to it by its eternal youth and its irrepressible virility and vigour. And we should take up the powerful hint which our Holy Father is surely giving us: that Summorum Pontificum is "irreversible". There is however the looming problem of a Latin-Rite Catholic Church that is disunited liturgically: liturgical forms and varieties just keep on proliferating. This can't be good. It undermines universality. In 2117 Pope Francis IV, as an act of mercy, might annul the lot of us. In so doing he might declare that any document emerging from our era to be no longer binding on the faithful. Our brothers and sisters to come can there by start again. What's panic-inducing is not the content of the statement, which is either rather pointless (yes, historical change is irreversible) or rises only to the category of "thoughts while shaving" ("you can't change change!) or is logically impossible (he's trying to bind future popes in a way that he doesn't feel bound). No, it's the unsettling sudden and unnecessary charge into rigid authoritarianism:"with Magisterial authority", something that apparently can't be invoked for the 6th Commandment? But confusion is his hallmark. The Novus Ordo is objectively and of necessity good. Certainly many of the particulars leave something to be desired, but so do those of the '62 Liturgy, as Fr. Hunwicke so regularly points out. 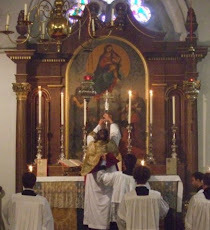 What is unfortunate about the Novus Ordo is that so often the external and practical reality is not commensurate with the spiritual and potential beauty (limited though it is as compared to the Ancient Rite). But that is a "cultural" problem, not one with the Rite itself. Leila, you are 100% right. Why are we simply assuming that future scholars and legislators will be bound by the changes of the 1960s simply because they were made? The neoGallican liturgies were entrenched in major French sees for over a century and were still overturned. The Quignonez Breviary was optional, yes, but still massively popular for a time. Then it was scrapped. And remember how Quo Primum abolished uses that were less than 200 years old? That's a century and a half older than the Novus Ordo is now. The liturgical progressive has set himself on perilous ground and he knows it, hence this desperate scrambling for an irreversible superauthority. I'm not worried that much. After all, the last century should go by the nickname "just wait a couple of decades". Changing the Good Friday prayers for the Jews? Pius XI said no. Just wait a couple of decades. John XXIII said yes. St. Joseph in the Canon? Just wait a couple of decades etc. Most things that happened after Vatican II were unthinkable in the early 20th century. So why wouldn't some future pope simply overturn the Mass of Paul VI? As always, there is a critical difference between a Pope teaching something or declaring something novel vs. a Pope restating and affirming a longstanding Tradition. And between a Pope declaring "I shall do X which is in my power" vs. a Pope declaring "No pope has the power to do Y". Claudio points to the 200-year mark of Quo Primus - somewhat arbitrary perhaps but a demarcation between tradition to be affirmed and novelty that can be erased with one stroke of a pen, or delete key. A following Pope can bring back discarded novelties at will but traditions live on even in hibernation. It was customary for people to stay after mass, in order to make their thanksgiving, just as it was customary for families to arrive early, in order to prepare for mass, through prayer. People who left right after the priest finished mass were probably trying to get to the bakery, before the line started. Sunday morning was always a time of great activity, getting properly dressed, getting to mass on time, buying the baked goods, getting the house ready for relatives. It was all about church and family. There was no shopping; the only thing that you could buy was food, and very little of that. We heard stories of priests who could fly through the mass in 15 minutes, but, personally, I never saw it. By some point- 1968? 1969? It had all changed. Things were so bad, that my mother had to get out aunt Helen, who was an Episcopalian, to buy religious articles for us from her church. Specifically, if you can believe it, Novus Ordo children's missals! Children's missals were a hot seller before Vatican II, but nobody was stocking them in the early 70's after the changes came in. Lack of demand. Apparently, the children's mass at some Episcopalian churches was being done a la Paul VI! It might be good to explore the example of the French Community of Saint Martin which I gather celebrates the Novus Ordo Liturgy and Office but in Latin with Gregorian chant. As shown in their videos the altar at their seminary church appears to be arranged for ad orientem celebration. They wear the soutane and are one of the few growing communities in France. Woody: What is the point of Latin in the NOM, be may as well use the Old Rite. Or, why not the Old Rite in he vernacular? The NOM was meant for the demise of the Old Rite and Old Rite Calendar and missals. NOMs tend to vary from parish to parish, diocese to diocese, from the acceptable to the totally unacceptable. In the CofE there were very low, low, middle, high and Anglo-Catholic parishes - such was not the Catholic way, but now appears to be so. Just a few thoughts. God has always demanded SACRIFICE. In fact the first murder was committed over Sacrifice. One good and one not so much? Cardinals of the Second Vatican Council all took the Oath Against Modernism. To Whom did they take the Oath? In the dictionary the words 'modern' and 'new' are interchangeable? Novus Ordo - New Order? Like I said, just thoughts. The Gallican prefaces should be ad libitum. The Nativity preface on Corpus Christi should be restored; Trinity for Advent should retained- the Gallican preface is rather challenging to sing. Before the Novus Ordo was imposed on the Church, the idea that a pope and his experts could simply deconstruct the ancient Mass and make up a new one was unthinkable. It clearly would never have occurred to the Council fathers that SC would be implement in this way. In The Spirit of the Liturgy, Cardinal Ratzinger wrote: "The pope’s authority is bound to the Tradition of faith, and that also applies to the liturgy. It is not “manufactured” by the authorities. Even the pope can only be a humble servant of its lawful development and abiding integrity and identity. . .
Liturgy “manufactured” in this way is based on human words and opinions. It is a house built on sand and remains totally empty, however much human artistry may adorn it." I understand this to mean that even a pope does not have the authority to simply make up ("manufacture") a new mass, almost ex nihilo. If the Novus Ordo is of God, nothing can stop it from prospering and spreading. If it is not, it will die out under the weight of its (to me) obvious failure. I don't think it matters what Pope Bergolio says or does. I agree that Summorum Pontificum is irreversible because it confirms the truth that the Ancient Rite cannot be abrogated and remains great for us. But that doesn't mean that some misguided pontiff won't try to abolish it or confine it to weirdo groups of scattered Traddies. Pope Benedict XVI might have enabled what he predicted almost 50 years ago: the Church will survive as isolated communities. And I predict that those communities will mostly be celebrating the Ancient Rite, because most other Catholics have been so long deprived of catechesis, liturgy, and culture that they are Catholic no more and have been picked off by the dominant culture. There won't even be a fight. "Woody: What is the point of Latin in the NOM, be may as well use the Old Rite." Well, the point is that it's easier, more accessible to people who have grown up with the NO, and works pretty well. Just look at St. John Cantius in Chicago. They do the 1962, the NO in Latin, and (I think they squeeze in somewhere) the NO in English. No table altars, no ditties, no Pseudo-Hypolitus. This was said by the same man who opened doors for Extraordinary Form and the Anglican Rite. I learned the 62 Missal or EF, because I was curious as to why this was such a battle ground. I learned a great deal about the loss of mystery; yet, I saw a slavishness to rubricism and oddities like the laity not saying the entire Our Father. If we had kept the Mass Ad Orientem, which I now do, then, perhaps, would the troubles that plague us, (E.g., architecture) be in existence? "Trinity for Advent should retained- the Gallican preface is rather challenging to sing." How so? Is it not set to the same tune? The Trinity Preface is far harder to sing, at least in my experience. Ratzinger's 1966 position is refuted by the uprisings all over England against the suppression of the mass (not to mention similar ones in Scandinavia). Is the then Herr Ratzinger suggesting that the piety of all those men of Cornwall, Devon, etc., was not genuine?? That "oddity" was first put forward by St. Gregory the Great to differentiate from the Eastern practice, and had become a Western Tradition. I do agree about the rubricism, though, since the Western church had lost quite a bit from its estrangement from the Easterners: the Easterners were a check to the growing Western mentality of rationalism (i.e., having everything make sense). Are you loafing at Lammas or dancing at Lughnasa?